Major health care giants like Dana-Farber Cancer Institute and Massachusetts General Hospital have pledged to improve diversity recruitment of health workers. Reports showed a lack of diversity in hospitals and care discrepancies among patients. The hospitals plan to increase resources, hire executives focused on improving diversity and inclusion in their organizations, and more. The lack of diversity in the healthcare workforce can impact patient care. Minority patients are more likely to seek out and follow advice from health professionals who look, sound, eat, worship and share the same cultural customs and values like they do. The U.S. population overall is changing and quite rapidly. In 2010, the number of residents age 5 and older speaking a language other than English at home had climbed 158% to 59.5 million from 23.1 million in 1980, according to the U.S. Census Bureau. By 2044, more than half the nation is expected to be made up of minority races or groups, according to a 2015 Census Bureau report. Yet, statistics show healthcare isn't keeping pace with population changes. Minorities made up just 14% of hospital boards and only 11% of executive leadership positions in 2015, according to a survey from the American Hospital Association's Institute for Diversity in Health Management. This disparity exists even though minorities represent roughly 30% to 35% of patients in hospitals. Dana-Farber Cancer Institute officials told Becker's Hospital Review they plan to hire a leader for diversity programs, and will require all faculty and administration to complete a bias awareness workshop, among other initiatives, as part of the institution's 2018 strategic plan. Dianne Austin, workforce diversity program manager at Massachusetts General Hospital, told Healthcare Dive, "Mass General has an orientation where new employees attend a program on diversity and inclusion and learn about various resources available to employees, such as a citizenship program, careers days and school admissions officers. There are also multiple staff committees focused on improving diversity and inclusion." Akron Children's Hospital supports a program that aims to improve Nursing diversity. The program's plan is to increase the number of interns in the program and provide tuition support during their senior year of college. The hope is that program participants will return to Akron Children's after graduation to begin their Nursing career. "Nursing diversity is vital to ensuring a positive experience for our patients," said William Considine, CEO of Akron Children's Hospital. "Not only does this program provide a valuable educational experience, it also helps Akron Children's recruit more prepared Nurses and helps our workforce reflect the diversity of the patients, families and communities we serve." UC Health intends to contribute $1.5 million to create University of Cincinnati scholarships designed to diversify the medical profession. The hospital system hopes the scholarships will help all local health systems diversify their workforce when hiring doctors, Nurses, pharmacists and medical technicians. Diversity & Inclusion initiatives can be difficult to sustain, but commitment to increasing D&I at all levels of your organization will bring new perspectives and values to your hospital/health system, which can help decrease health disparities across the board. Bravo to the healthcare leaders that are seriously acting on their D&I initiatives! Do you see progress in this area where you work or teach? 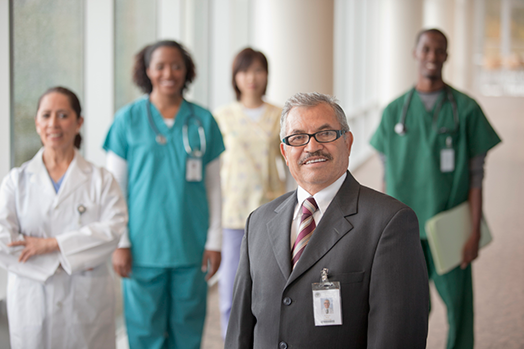 Healthcare organizations must know in order to be successful, you need a diverse workforce. The key to success in this area is retaining that staff and knowing how to defuse conflicts. This is especially true in settings like hospitals, where mistakes can mean life or death. Poor communication is one of the leading causes of medical errors, according to the Joint Commission. Medical errors are the 3rd leading cause of death in the United States—right after heart disease and cancer, and it’s more prevalent than respiratory ailments, stroke and Alzheimer's disease—according to a study out this year from The BMJ. Author Martin Makary, MD, of Johns Hopkins University, and colleagues estimate that 251,000 Americans die each year from such mistakes. Some instances have nothing to do with interpersonal conflict, but employees at odds with one another are less likely to spend time making sure they understand each other during crucial events like a patient hand-off. Dianne Austin, workforce diversity program manager at Massachusetts General Hospital, told Healthcare Dive, creating robust support networks is key to helping employees identify and deal with tension or potential discrimination from other employees. They also need to be able to talk freely with others who may be in similar situations. “There’s a lot that we do to really try to help employees feel that they have a voice and that they’re important,” she said. Susan Woods, a workplace consultant, says there are a few major dynamics in diversity-related conflict, including respect and disrespect, as well as recognition and identity. achieve, or that they can be overlooked and don’t count. Remarks like the ones below convey messages about respect. as it is deeply felt by the offended party. but may not have been communicated with consciously malicious intent. individuals as unique persons and, at the same time, as members of groups. Research shows that conflict can be frequent in healthcare organizations because of the high workload volumes, pressures to move quickly and the importance of decisions being made. These conflicts can affect companies in many ways, including high staff turnover rates, reduced productivity and litigation costs. The best processes start early and attempt to prevent conflict. Austin said Massachusetts General has an orientation where new employees attend a program on diversity and inclusion and learn about various resources available to employees, such as a citizenship program, careers days and school admissions officers. There are also multiple staff committees focused on improving diversity and inclusion. Healthcare managers can help ease conflict by listening carefully to employees, quickly addressing the source of the problem, instituting strict and clear policies and educating staff about those policies, she wrote. Massachusetts General has multiple ways for an employee to bring any concerns to light, including an anonymous hotline, Austin said. The HR department will review whatever is submitted and the relevant department head is told the details. “We really try to pull managers and the appropriate people in so we can get to the bottom of it based on the information provided,” she said. Sometimes, the problem starts with a patient who refuses to be cared for by a certain nurse or doctor, and may use racial slurs or other inappropriate language. The nurse manager will respond and tell the patient all providers are equally trained and capable. The patient is then told they can go to another hospital if they will not be respectful to all employees. The affected employee can decide whether or not to continue working with the patient. Diversity and inclusion efforts should reach all the way up the ranks to the executives, making sure their C-suites and boardrooms are also diverse and reflective of the surrounding community. The American Hospital Association's Institute for Diversity in Health Management released a comprehensive report titled Diversity and Disparities: A Benchmarking Study of U.S. Hospitals in 2015. The results of the survey were not exactly positive. In fact, the survey found that minority representation on healthcare boards across this nation stood at just 14%—precisely the same percentage reported in a similar survey two years earlier and a similar study conducted in 2011. Deborah Bowen, president of the American College of Healthcare Executives said the best ways to remedy poor diversity in C-suites is to start cultivating a diverse group of people who have an interest in leadership early on in their careers. Post-graduate fellowship programs and scholarship for mid-level executives can be helpful. Hospitals should provide leadership development and training as well as other career resources, she said. The diversity of people in the US has changed considerably. As stated at the beginning of this article, our hospital and healthcare system employees need to reflect their patient population at all levels within their organization(s). Sensitivity to language, cultural, sexual, and physical differences in both your staff and patients is critical for a harmonious and productive environment.